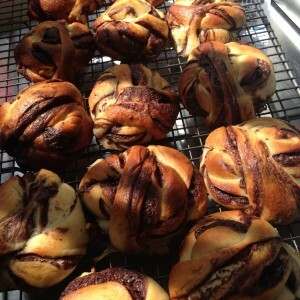 Oh yes it is and here is a simple recipe for chocolate bread in one of its many forms. I am not sure what this little bun should be called. 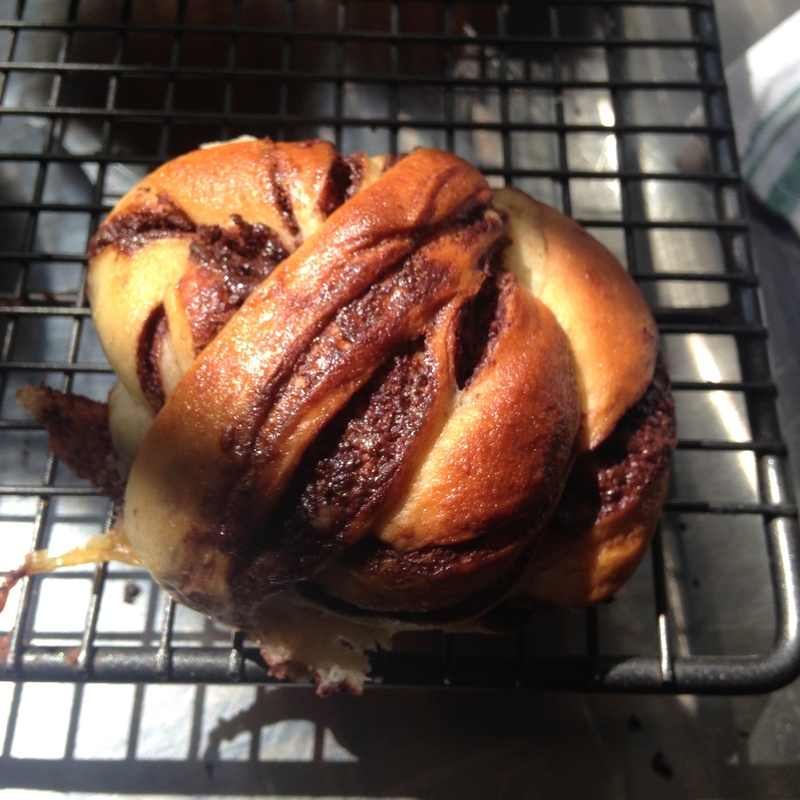 Is this a recipe for a chocolate babka? 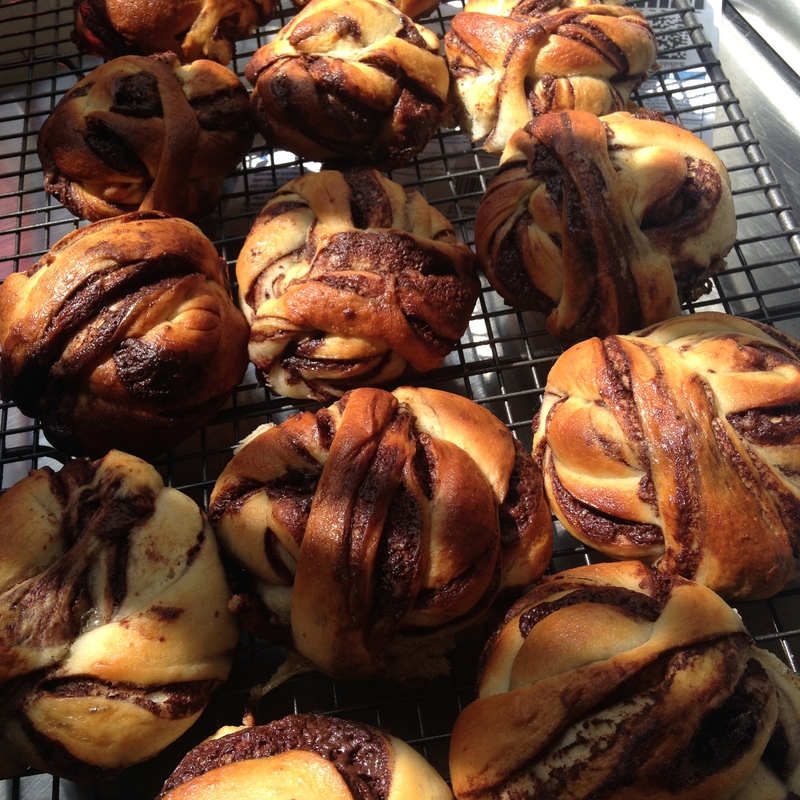 Or is it a recipe for a chocolate bullar (like the kanelbuller but with chocolate) or is it simple a recipe for that amazing chocolate bread that you once made? It does not matter. What matters is that you try this incredible, easy recipe for delicious chocolate bread. if you are Mexican (or just if it sounds nice to you), add 1/2 teaspoon or more of cinnamon. Measure the flour into a big bowl and make a well. Sprinkle the yeast and the sugar into the well and add 100 grams of water. Flick a little flour over the water to close the well and cover with a tea towel. Wait for one hour and the yeast will foam up through the surface of the flour. If it does not, dig through the surface to check for signs of life. Add the rest of the water, and the salt. Knead for ten minutes and then add and the butter. Knead well until the butter is completely incorporated and the dough gets shiny and is elastic. Pop the dough back in the bowl, cover, and let rise for 2-4 hours or over night in the fridge, until it has doubled in bulk. 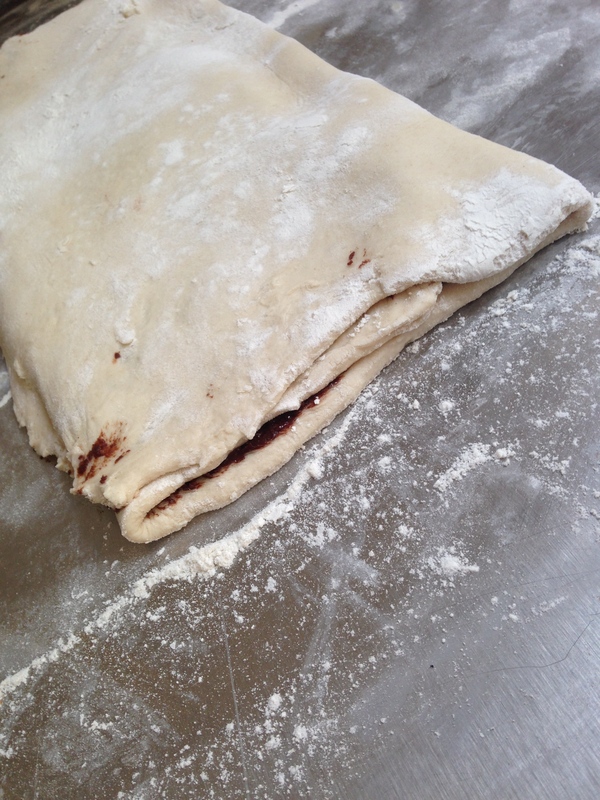 While the dough is resting, melt the butter and chocolate (filling) together and then stir in the cocoa and the icing sugar. Cover and leave it. It should be easily spreadable. 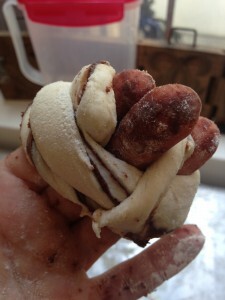 Generously flour your work surface and pull the dough out of the bowl and on to the work surface. Flour the top of the dough and roll it into a rectangle. The short side should be around 30 cm and it should be about 0.5 cm thick. 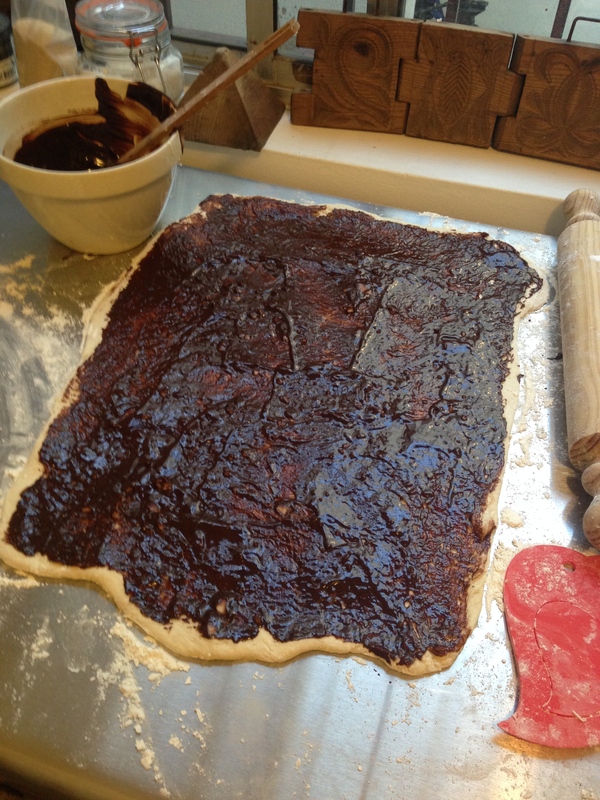 Take the filling out of the bowl and spread it all over the dough rectangle. Be patient and spread it all the way to the very edges. 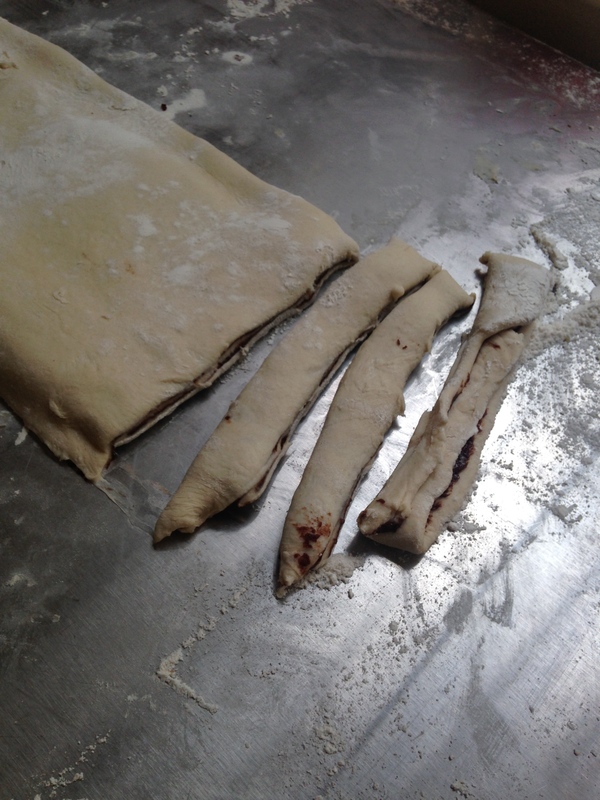 Fold the dough up along the long side of the rectangle into thirds, as if you were folding a piece of paper for an envelope. Using a scraper or a pizza cutter (knife is a worst case scenario) cut the dough into sections about 2 cm wide. Form these into twists, stretching them as you do. Wrap them two and one half times (this is really important - you will see why) around the first three fingers of your non working hand (the working hand need to do the wrapping). You start by pinching one end of a twist between your thumb and your third finger. 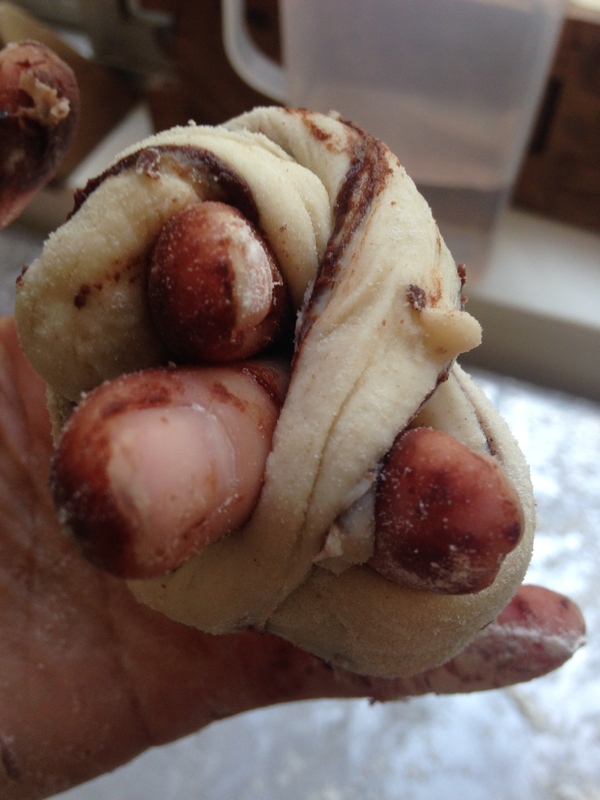 Wrap the dough around loosely counting 1, 2 and then you get (this is the "half" bit) to the back of your hand. Bring the loose end of the dough up over the strands of dough you have wrapped around your fingers add thread it between two of your fingers. Take it back over the other side of the strands of dough, and then tuck it under and remove the whole thing from your fingers. Bunch it up nicely and place it on a baking tray you have covered with non stick baking parchment. Sounds complicated, IS a bit complicated, but practice makes perfect. I warn you it will take some practice, but even blobby, broken, bunched up bits of dough seem to look rather artful once they are baked. Cover with a tea towel and let rise 45 minutes. Glaze the buns with the egg wash and then pop them into the oven. 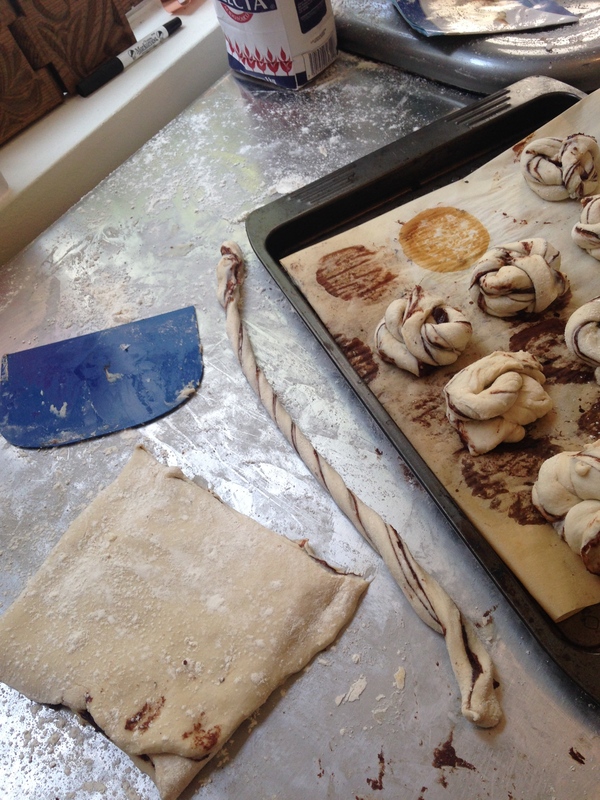 Bake for 15-20 minutes and cover them with a piece of parchment paper if they are getting too brown. Cool completely on a wire rack (that's wishful thinking because they are terrific when they are warm). Want to learn more about bread! Click here to take a baking class and enjoy a really fun, informative session where you will learn a lot, eat a lot, and have a lot of bread to take home. 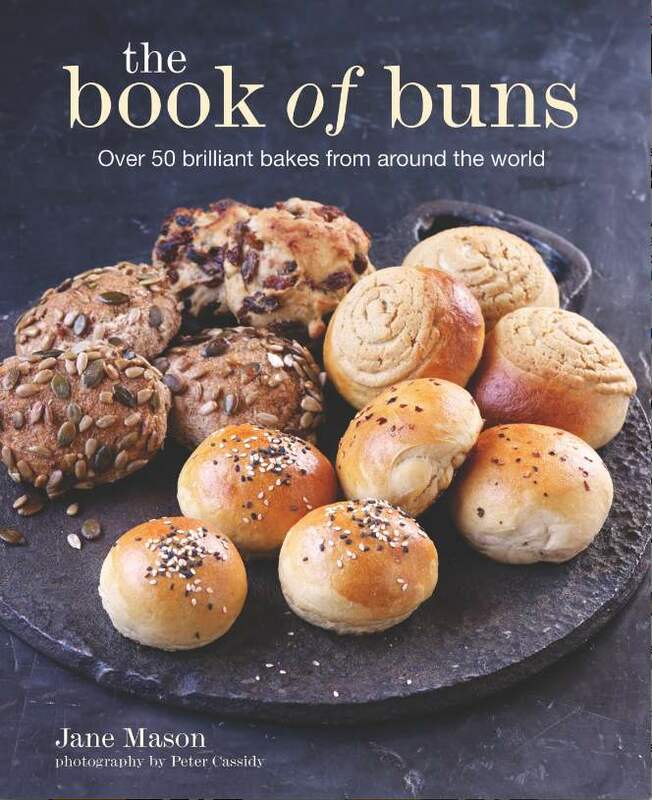 If you enjoy baking buns, why not buy The Book of Buns and join our facebook group called "Baking our way through the book of buns" to enjoy some bun challenges every few weeks. Jane Mason's second book has inspired a facebook group. Join us and bake your way through the Book of Buns in the company of others! How much sugar in the dough??? Sorry for delay! Am on holiday and just turned on computer. Indeed - sugar! I use 50 grams. Sorry about that! wrap around my fingers because the chocolate mixture went solid and broke apart. Is that normal? So they're out. The egg wash made them go very brown. Must admit they look a bit messy but taste yummy. I left them in the oven for 20 minutes and they were still a bit raw in the middle even though the outside is crusty. Could this be due to me having a very wet dough? 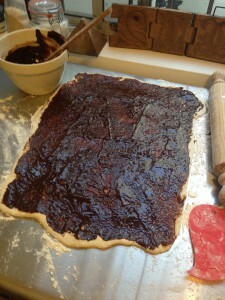 I don't think it is to do with the dough being wet because it is. 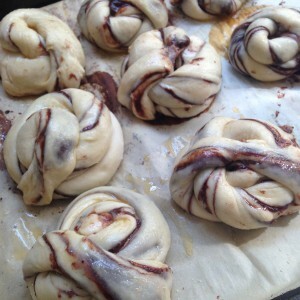 Buns can be tricky because they are usually sweet and then with the glaze they caramalise quickly in the oven. Depending on your heat source, they all bake a bit differently. You can tap a bun to listen for hollowness - it's don't if it sounds hollow and if not, put them back in for another 5 minutes. Always watch buns the first time you bake them - until you get to know your oven - andif they are getting too brown, cover them with a sheet of parchment paper or tin foil (paper better) and that stops the browning process, allowing them to bake through without getting too too dark. I am so glad they tasted good! I love them. You can do the same technique and dough and put anything in the middle - butter, sugar and cinnamon; nutella; honey butter; anything you can imagine! Hi Charlie, sorry for the delay in answering this. The chocolate mixture shold not really go solid but it does get messy twisting them and twisting them does take practice. The amazing thing is that no matter how odd they look in dough form, they always bake beautifully!